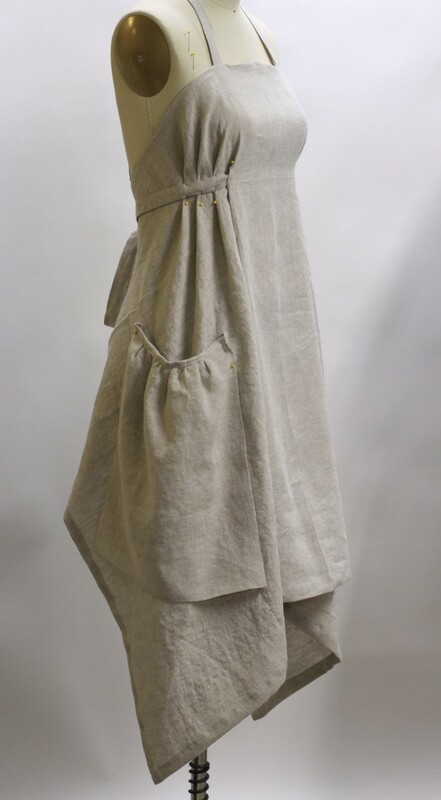 Any history on Aprons that I read, always begins with linen. It seems that linen was the first fabric used and I find it curious that somehow in todays culture it is largely ignored. No one I know has a linen Apron, this exclusion makes me curious as to how it got left behind. Unable to quiet myself on the subject, I bought a bolt of it. I thought I would get to know this centuries old fabric, that had served as such a staple of my ancestral grandmothers. I wondered what relationship I might build. Maybe I would find out very quickly why it could get left behind….. or not. Ancestors would not have handled it delicately, everything was scrubbed and dried. I unrolled all 15 yards onto the floor, cut it into 3 hunks and stuffed it unceremoniously into the washer on hot. Then crumbled and wet, it was stuffed into a hot dryer. What came out of that dryer, well, I fell in love. It was soft, crumply, and had a wonderful drape that begged for Mary. (my dress form). I got out my big dressmaker pins and huge dressmaker shears and played. I played for hours. It takes shapes that you want and drapes where you want. How this wondrous fabric was ever eliminated is beyond my understanding. I stitched, gathered and pleated, and bound. And while I was out of the box and feeling free creatively as I made friends with this awesome amazing new studio partner, how could I possible make a straight hem? Surely we will not be so confined! …at least not today. My heart is captured, linen is my new muse….. and the place I put the really cool buttons that I bought before I new where I would be putting them. Thankfully I found I owned lime embroidery thread. This will always be my favorite linen apron. Because this is where we met and fell in love. This is where a new romance started. I hope it sells well because I really, really want to go buy linen in some of the gorgeous colors they offer. I am in love. My next pieces are going to incorporate my other secondary loves; lace, ribbons, machine quilting, and vintage pieces. I love new relationships when love is fresh, free and creative. It’s like fresh air into your soul. I would love to purchase this apron or a pattern for it if you ever bring it back! The cut is just beautiful. Lovely work for a lovely fabric. Love your contagious joy and your beautiful apron. I too would by a pattern if you ever make that leap. Your love of this fabric is inspiring. Thank you for sharing! The demise of linen was political, deliberately instituted to favor cotton in the US over British linen. As cotton gained ascendancy and the old equipment broke down, the long, lovely linen fibers were cut short in order to make use of plentiful and cheap cotton manufacturing machinery. That is why historical linen fabrics and lace are far superior esp. re: fineness to modern… flax can have an 8 foot long staple! Flax is also stronger when wet than dry, so it loves laundering and discolors when left unwashed too long. Flax does not readily accept dyes, hence it is commonly available only in natural, bleached and muted colors. Thanks for this post! 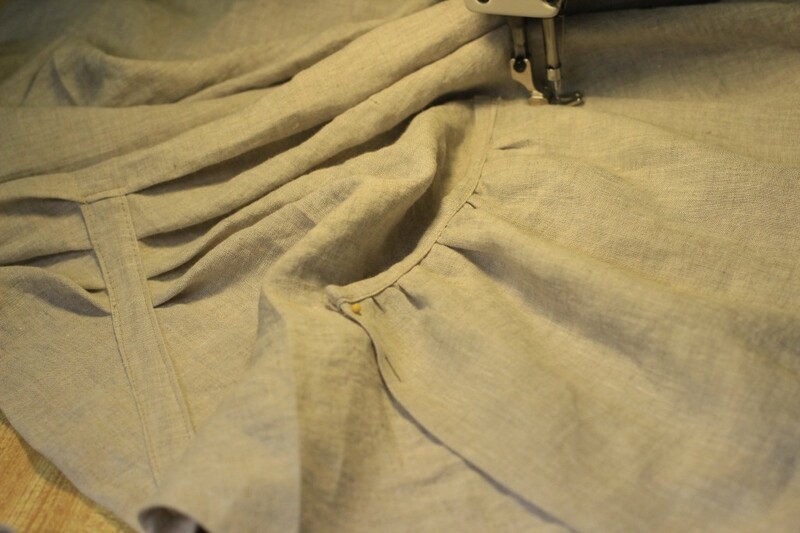 The construction of this apron is very simple and elegant, just controlling the gathering of a simple square with pleats under the ties. Thank you for the history, interesting. I ‘m going to follow that further. Thanks. I always loved Linen. Ive always liked apron patterns that do not stress the neck but distributes the weight over the shoulders. It is a lovely pattern, though. I grew up in Denmark in the 40’es and didn’t realize that my very old-fashioned mother( she was raised by her great grandmother , 83, after her mother died when she was 5) always insisted I wore an apron: I found out years later that in school they called me : “The girl with the aprons.” I had one for everyday of the week. I hated some days!! Oh well! It is fun to experiment. I learned to make my old custom patterns when I was 13 and have been making leather garments amongst other challenges. Aprons are fun! I would also love to buy the pattern. Me too! Love this one!!! 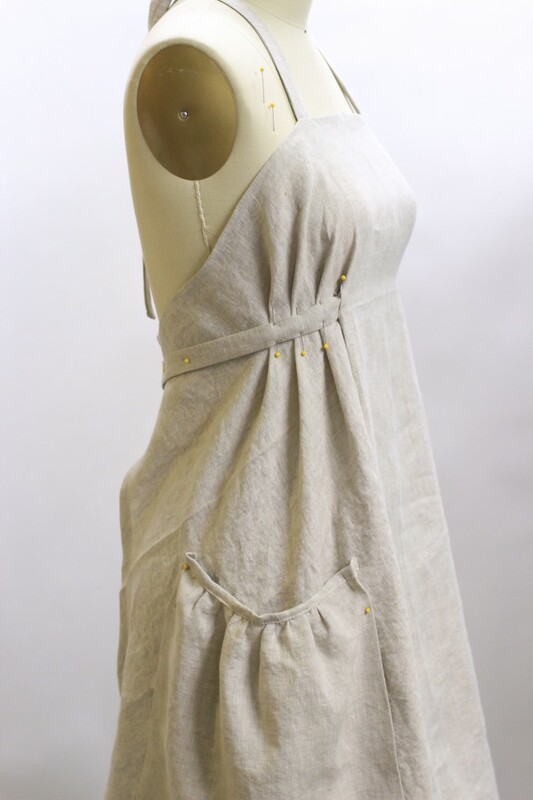 Have you considered selling the pattern itself for those who enjoy making their own garments? Hello, Thank you for the inquiry. We have not ventured into that market. Shoudl we make that leap, we will announce it on our Facebook. For those of us who do not follow Facebook, is there another venue to your possible website? Our website is http://www.vermontapron.com. If you go there you can sign up for our email list. Should we make the jump into patterns, we would announce it to our customer list. Beautiful. Have you considered using your pattern to make it into a summer dress? It would be awesome. Thank you. We have tried that before and the dresses did not sell well. Although we will consider introduing them again as the jumpers do pretty well. Sadly, the link to purchase did not work for me. We sold out at Christmas. It has been temporarily pulled from the website, once we restock it will be available again. It is one of our favorites! 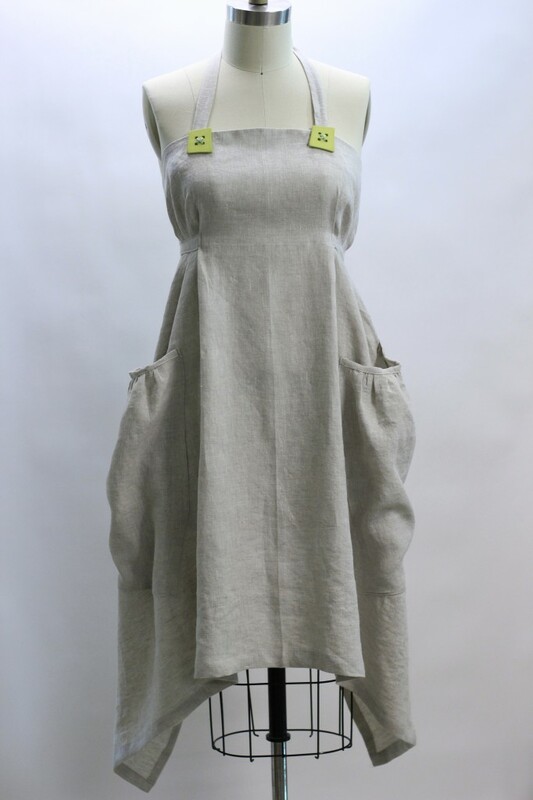 Do you still sell this linen apron? I just love it! We sold out at Christmas but are awaiting more stock and then it will be available again. Thank you for inquiring! Wow! Gorgeous!! Do you sell the pattern? No sorry, we don’t sell our patterns, but thank you for the compliment of asking! Your passion for what you do comes through so vividly in your writing. It makes me want some of what you’re having and builds an excitement for what you’ve made!